For Cricket lovers, from today on, there are going to be more matches… at the land of Maori… at the time of posting this at 8.10 am on 19.1.14, NZ are 111 for 2 in 24.4 overs… Here is something on the Venue and land ~ rather than any Cricket update…. Polynesia is a subregion of Oceania, made up of over 1,000 islands scattered over the central and southern Pacific Ocean. The indigenous people who inhabit the islands of Polynesia are termed Polynesians and they share many similar traits including language, culture and beliefs. Historically, they were experienced sailors and used stars to navigate during the night. New Zealand belongs to Maoris, the indigenous Polynesian people of New Zealand. The Māori originated with settlers from eastern Polynesia, who arrived in New Zealand in several waves of canoe voyages; over several centuries in isolation, the Polynesian settlers developed a unique culture that became known as the "Māori", with their own language, a rich mythology, distinctive crafts and performing arts. Arriving at Kiwiland, Indian skipper Mahendra Singh Dhonion ruled out experimenting too much with his settled team in the series against New Zealand but said the five-match rubber should serve as a good exposure to some of his players before the World Cup. Over the years, Dhoni is Captail cool and one totally unruffled on field, despite losing some – especially overseas…. Hailed as a shrewd thinker, he is also criticized for being too defensive in Test – here he has a unique challenge, especially when it comes to field placements. In the present side, Yuvraj is not there – today he Raina over Ambati Rayudu ~ and Binny did not make his debut… bowling is in the hands of Ishant, Mohammed Shami, Bhuvaneswar Kumar, Ashwin and Jadeja. "We will see what suits us best and then we will move ahead. As of now, after the Greg Chappell era, experimentation is something we have done away with. We don't really change too many things anymore. We will give chances to a few players and hopefully they will rise up to the occasion and accept the challenges that they are pushed into," Dhoni is quoted as saying. Some grounds are differently shaped – it is not subcontinent wickets nor similar to bigger ones of Gabba, Melbourne…. Batsmen may have to pick easier sides – straight boundaries are long – there would be strong breeze… “It is quite far from India,” was MS Dhoni’s first reaction when asked how he felt on reaching New Zealand. That was at Auckland airport, and team India will have to travel more as New Zealand consists of two big islands. Cricket in New Zealand is usually played on rugby grounds, which means the shape of the outfield is anything but normal. It is not easy for a visiting captain to immediately work out the angles and place his fielders in optimal positions. After a mixed series in South Africa – Indian players had around ten days off before they started their journey to New Zealand. They had five days to acclimatise and prepare before the first ODI. They did fielding drills and played football on the first one. Rising from cities, small towns and country paddocks filled with farmers’ stock, no part of New Zealand’s landscape is quite complete without a set of rugby goal posts. Rugby is New Zealand’s most-played sport as every Sunday players lace up their boots and run onto rugby fields to chase the oval ball. 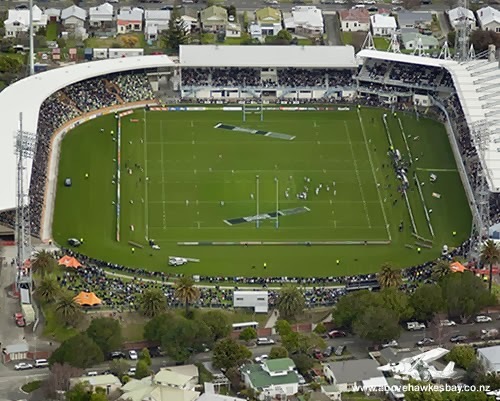 The famed Eden park hosted the inaugural 1987 Rugby World Cup (RWC), and the 2011 RWC was the second world cup final to be held at the ground. Today’s match is at Napier, a New Zealand city with a seaport, located in Hawke's Bay on the eastern coast of the North Island. About 18 kilometres south of Napier is the inland city of Hastings. These two neighbouring cities are often called "The Twin Cities" or "The Bay Cities" of New Zealand. Napier is about 320 kilometres northeast of the capital city of Wellington. Napier is the nexus of the largest wool centre in the Southern Hemisphere, and it has the primary export seaport for northeastern New Zealand – which is the largest producer of apples, pears, and stone fruit in New Zealand. Napier is a popular tourist city, which was ruined by the 1931 Hawke's Bay earthquake and has recovered well thereafter. McLean Park the venue of day is also a Rugby ground; it is the home teams for this ground are the Hawke's Bay Rugby Union and Central Districts Cricket Association. The two ends of the stadium are named the Centennial Stand End and Embankment End. Its close proximity to the International Date Line makes it the world's most easterly Test match ground. Will India win today and the Series ? Over all India has won 46 of its 89 encounters… but only 10 off the 30 in New Zealand losing 17; in neutral venues – teams share win of 15 matches..